Confused.com launched in 2002 and was the UK’s first online car insurance price comparison website. Since then, the site has grown to cover a wide range of sectors, allowing users to compare the prices of not just car insurance, but home insurance, utilities, holidays, travel insurance, pet insurance, caravan insurance and money products like life insurance, savings and credit cards. "This was the most successful campaign we have ever executed in terms of coverage an inbound links." We work on a project-by-project basis with the comparison website Confused.com. We have carried out a number of campaigns for the site over the last three years, largely revolving around more visual stunts and video projects. As part of the CSR program for Confused.com, we helped to raise awareness of drink driving in the run up to Christmas (a key time for accidents caused by drunk drivers). We filmed and edited a hidden camera style video and generated media coverage for it afterwards. The video featured a seemingly drunk man (an actor) on a busy high street trying to unlock his car to get in and drive off. In his “drunken” state, he was finding it difficult to gain access to the vehicle and asked passersby to help. We wanted to see how many people would help him gain access to his car, despite his seemingly intoxicated state. The majority of people had no qualms about helping him. The campaign was featured on the likes of the Mirror.co.uk, The Drum, The Sunday Times Driving supplement/website, AOL Cars, Campaign, Creative Review and gained coverage as far as Australia and New Zealand. A separate campaign we created for Confused.com saw us conduct a social experiment involving eight drivers (four male and four female). Each person was told to drive the same distance (500 miles) in a branded Confused.com car, with no music during the first half of the journey and music being played during the second part. The four men and four women had a different playlist to listen to during the part of the journey in which they were allowed to listen to music (hip hop, classical, heavy metal and dance). The experiment aimed to discover the effects of different music genres on driving styles. Each driver was asked to activate Confused.com’s mobile phone app MotorMate, which monitored speed, acceleration and braking during the time in which they were driving (whilst listening to music and when they weren't). A psychologist from London University, Dr. Simon Moore, analysed the results to reveal what song types made people drive the safest or most dangerously. 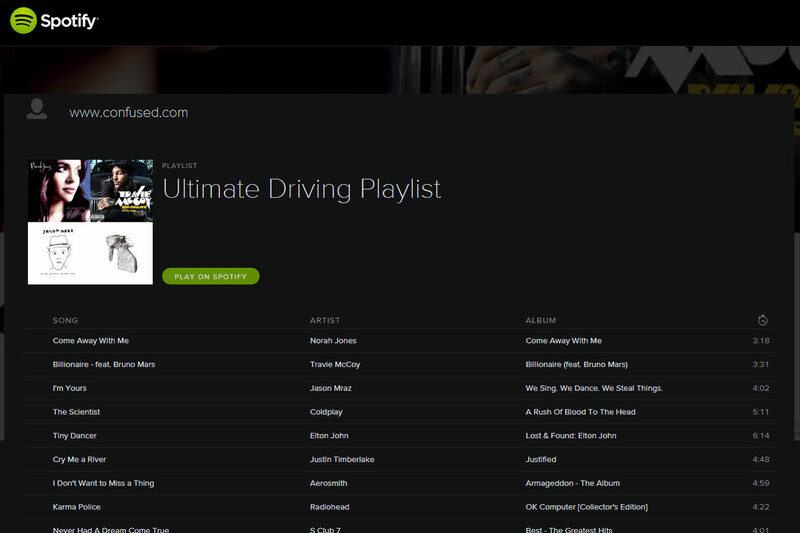 From this, the ultimate safe driving playlist was created; featuring songs with a tempo that mimicked the human heartbeat (60-80 beats per minute). This list was created on Spotify for people to download. The campaign aimed to raise awareness of the app and it achieved widespread national coverage, leading to a huge increase of app downloads.ShortList, The Drum, The Sun, Digital Spy, Mashable, Huffington Post, ABC News, The Independent and other media outlets featured the playlist story. This was Confused.com's most successful media campaign in terms of links, in-bound traffic and coverage.